Robert Hall stars as millionaire newspaperman Britt Reid, fighting crime in the guise of his gas-gun toting alter ego. "Matching wits with the underworld," Reid risks his life "that criminals and racketeers within the law may feel its weight by the sting of the Green Hornet!" 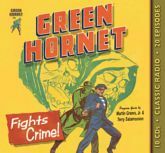 Raymond Toyo co-stars as Kato in these exciting episodes, one of which features the first appearance of The Green Hornet's nemesis Oliver Perry! Digitally restored and remastered, many of these adventures have never before been available to the public. Hear them now for the first time since their original broadcast! Includes a Program Guide by Martin Grams, Jr. and Terry Salomonson.